BOSTON, MA, MARCH 6, 2019 – Cogent, Zayo, GTT and Sprint have achieved a position on the 2018 U.S. Competitive Provider Ethernet LEADERBOARD, according to Vertical Systems Group’s latest research. The Competitive Provider LEADERBOARD, which ranks companies in order based on U.S. retail Ethernet port share for this segment, is an industry benchmark for measuring Ethernet market presence. To qualify for the 2018 U.S. Competitive Provider Ethernet LEADERBOARD, companies must have either a top rank or a Challenge Tier citation on the 2018 U.S. Carrier Ethernet LEADERBOARD. Cogent, Zayo, GTT and Sprint each qualify for a position based on their 2018 Challenge Tier citations. 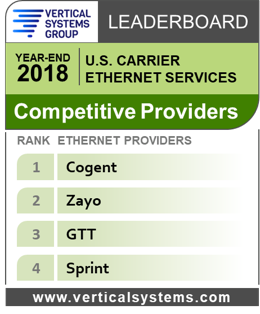 For the second consecutive year, there were no Competitive Providers with a top rank on the 2018 U.S. Carrier Ethernet LEADERBOARD. Competitive Provider is one of three U.S. provider segments, along with the Incumbent Carrier and Cable MSO segments. This segment encompasses CLECs, regional and global providers, and specialized carriers selling Ethernet services in the U.S. market. Other companies in the Competitive Provider segment include the following (in alphabetical order): American Telesis, BT Global Services, Consolidated Communications, Crown Castle Fiber, DQE Communications, Expedient, FiberLight, FirstLight, Fusion, Great Plains Communications, Logix Fiber Networks, LS Networks, Masergy, MegaPath, MetTel, NTT America, Orange Business, Segra, Tata, Telstra, TPx, Unite Private Networks, US Signal and other competitive providers selling retail Ethernet services in the U.S.